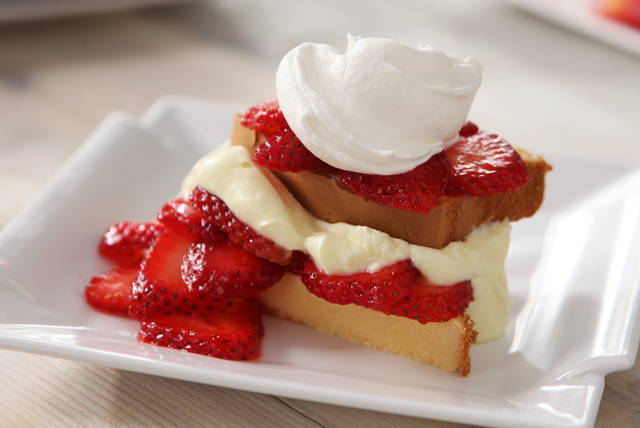 Strawberry shortcake gets a citrusy kiss in this recipe made with lemon pudding and fresh-squeezed lemon juice. Toss berries with sugar and lemon juice; let stand 10 min. or until sugar is dissolved. Meanwhile, cut each cake slice diagonally in half; place 1 cake piece on each of 12 dessert plates. Beat pudding mix and milk in large bowl with whisk 2 min. Stir in half the Cool Whip. Spoon 2 Tbsp. berries over each cake piece on plate. Top with pudding mixture, then remaining cake pieces, berries and Cool Whip. These easy-to-make desserts can be prepared ahead of time. Refrigerate up to 1 hour before serving.